Restore your vision so you can do the things you love most. Cataracts are very common, affecting most people over the age of 65. A cataract occurs when the natural lens in your eye becomes discolored and clouded, resulting in hazy or blurred vision. If left untreated, cataracts can eventually lead to blindness. Cataract surgery replaces the clouded lens with a new clear artificial one. Cataract surgery is among the most commonly-performed in medicine, plus, technological advances have made the procedure even more safe and successful. Magruder Eye Institute offers the most advanced procedures for cataract surgery to our patients throughout the Orlando areas. This includes laser-assisted cataract surgery and the latest in replacement lenses designed to treat nearsightedness, farsightedness, astigmatism, and presbyopia. Cataracts can impact your life in more way than one, if you live in the Orlando areas, make sure to call our team of professionals today! Surgery at Magruder Eye Institute. You’re in good hands. The Lifestyle Vision™ Custom Laser Cataract Surgery program at Magruder Eye Institute is a cooperative process designed to better educate those patients considering laser cataract surgery regarding the latest surgical options available today. Your ophthalmologist and our staff work closely with you to match the best Intraocular Lens, or IOL, taking into consideration your lifestyle, eye health, and vision goals. 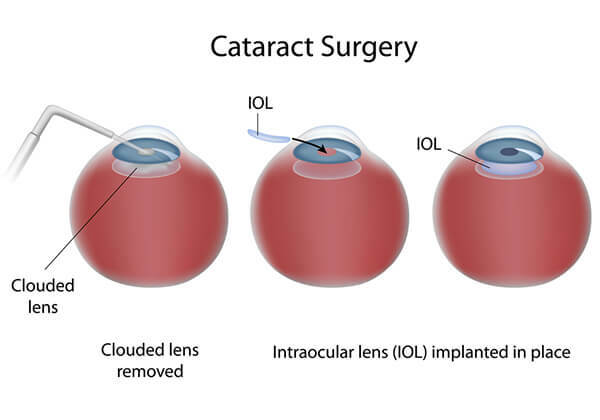 The IOL is the artificial lens that will replace the clouded natural lens in the eye during the surgery. New Medicare rulings now allow for eye surgeons to offer all cataract patients options, including laser-assisted cataract surgery, and Multifocal Lens Options, both as an additional (out-of-pocket) expense to the patient. It is one of the most commonly performed Medicare reimbursed surgeries in the United States according to many sources. Cataract surgery is routinely performed through a small, “micro” incision. Through a process known as phacoemulsification, an ultrasonic probe is inserted into the incision to break up the old lens using sound waves. For patients who choose the laser-assisted option, our cool femtosecond laser can be used to soften the lens to make removal easier. Following that, the old, clouded lens is carefully removed. Your surgeon will implant your new intraocular lens. The incision (typically stitchless) is then closed, and your recovery begins. Recovery involves modifying your activities for a few days and using eye drops to prevent infection.